This article is 163 days old. 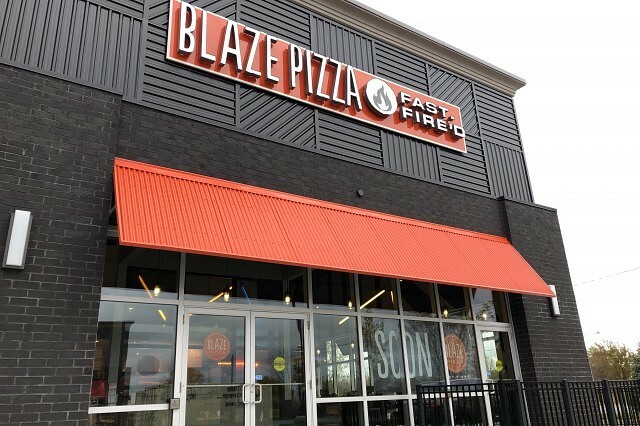 Blaze Pizza is now open on Division Road. It’s known as a “modern-day pizza joint” for its custom-built, artisanal pizzas, freshly made salads, blood orange lemonade and s’more pies. Each restaurant features an interactive assembly-line format that allows guests to customize one of the menu’s signature pizzas or create their own, choosing from a wide selection of fresh, artisanal ingredients. The pizzas are then sent to a blazing hot open-flame oven where dedicated “pizzasmiths” ensure that the thin-crust pies are “fast-fire’d” and ready to eat in just 180 seconds. To celebrate the opening of the company’s newest restaurant in Windsor, anyone who visits Blaze’s new location on Friday, November 9th from 11am to 10pm and follows the brand on Instagram, Twitter, or Facebook will receive a free build your own pizza. The new, local restaurant has developed a turn-key, in-restaurant fundraiser program that returns 20% of an event’s proceeds back to local organizations, and will be partnering with local schools, sports clubs and other organizations to host fundraising events. The new, 2,552 square foot Windsor restaurant has also created 50 jobs locally. It is open 11am to 10pm daily. Blaze Pizza is located at 650 Division Road and joins recently opened Freshi, Dollarama, and For Your Fur Kids. Five Guys and Qdoba are also opening in the plaza soon.